A dead or declining tree on your property is not only an eyesore, but it can also pose safety concerns. Harsh winter months with strong winds and rain can cause your dead or declining tree to fail, leaving your home and property at risk. If you suspect one of your trees might be declining, schedule an appointment with an arborist to evaluate your tree for removal. There are several tree removal techniques an arborist may choose to use. Tree felling is one of the easiest ways to remove a tree but is also not commonly practiced in Metro-Atlanta. Felling is when a notch is made at the base of the tree and the whole tree falls to the ground. This procedure is the quickest way to get a tree to the ground but can go wrong and cause damage to people and property around it. Felling produces the most clean up, the whole tree once on the ground must then be cut up and hauled away. 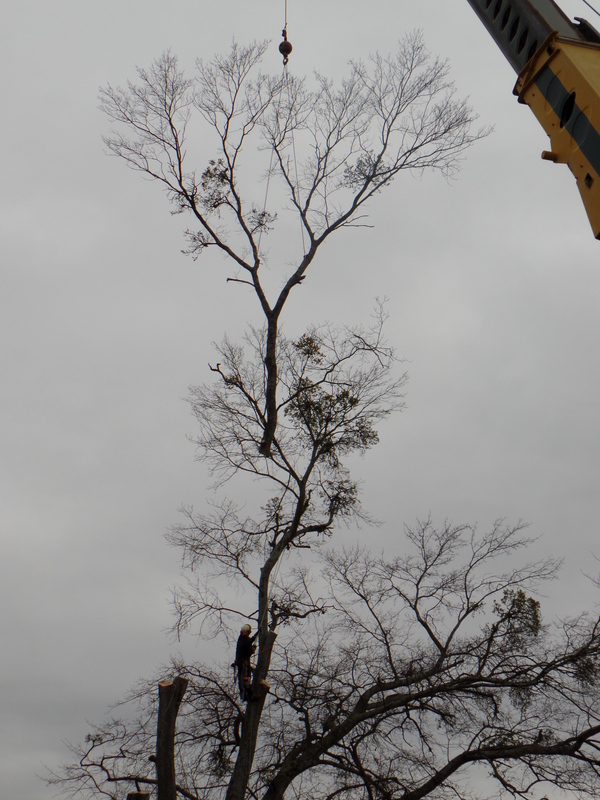 Traditional tree removal is a more common practice for removing a dead or declining tree. This technique requires the tree to be safe enough for a tree climber to ascend the tree. A climber will work his way up the tree removing branches on the way, he may choose to let the branches fall safely to the ground if the job site allows or he could choose to rope each branch safely to the ground with the help of a groundsman. When the tree is stripped of its branches the climber will then cut manageable pieces of the trunk to let fall to the ground or he may choose to rope each piece and lower it to the ground in a controlled manner. The risks with this technique are minimized when each branch is lowered using a roping and rigging technique but the climber and his crew must work together to determine the weight and structural strength of the rigging point to safely lower the branches and trunk. Crane removal is used when the tree must be lifted over a house or other large structure or is too large to remove from its location. With this technique a climber will ascend the tree and attach branches and portions of the trunk to the crane with a cable for its safe removal. If you are considering removing one of your trees this winter, make sure you consult with a Certified Arborist. Only an arborist can evaluate the safest way to remove your tree and reduce the risk involved with tree removal. Give us a call today and one of our Certified Arborists will come out and inspect your trees! 404.261.5000.